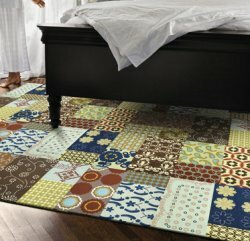 The Ebricks.com Rugs guide offers information about companies such as Dunberry Hill Designs and Flor. 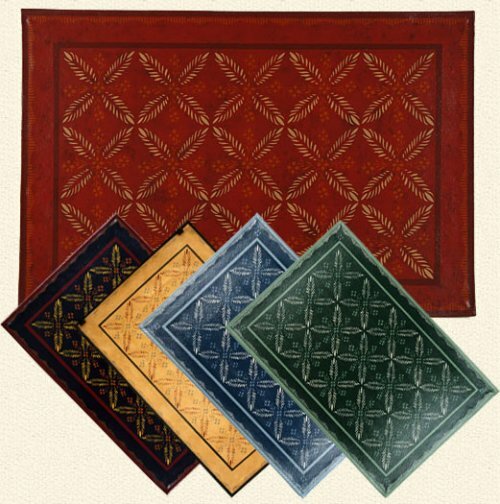 Carpet squares made of renewable and recyclable materials in a range of colors, textures, and patterns. Create a rug, runner or wall to wall design. Vermont company makes hand-painted floorcloths and mats of cotton canvas backed with cork. Olson sells handsome, traditionally styled area rugs - and has been doing so in Chicagoland since 1874. Heirloom quality custom floorcloths. Website shows 150+ examples of work spanning a variety of styles including Early American, Victorian, Arts & Crafts, Deco, Batik and contemporary. This Rochester, NY, business specializes in custom floorcloths, made to order. The company offers stock, contemporary designs - and also will work with customers on custom designs. Importer and supplier of Armenian and Tibetian hand-knotted carpets. Site contains detailed photos of products, plus a local dealer locator. Based in rural coastal Maine, British designer and artist Patricia Shea offers handtufted, custom-designed rugs, as well as tile murals and custom tiles. Vermont artisan creates canvas floorcloths in historic reproduction and custom designs. Based in Georgia, Mohawk is a leading floorcovering manufacturer and distributor. The company sells carpet, laminate flooring, hardwood floors, ceramic tile and area rugs. Its website offers lots of information about its products - and includes a dealer locator. This Mexican shop offers hand-loomed traditional Oaxacan rugs, made by master weaver Pantaleon Ruiz Martinez. Based in St. Andrews, New Brunswick, this family-operated business offers original floorcloths and painted furniture. Painted canvas rugs offer durable, unique floor dressings. Carpet tiles come of age with these kits.